It got me thinking about how much more family-friendly businesses could be..
1-Open earlier! I can’t be the only parent up at 6 trying to keep their child entertained?! Why don’t any soft plays open before 9, or even 10?! I guarantee you if opened at 7 or even 8, you’d always have customers at these times! 2-Open a drive-thru! McDonalds is a guilty (not-so) secret of mine. It was SO frickin’ handy when W was a baby and I needed to nip out for lunch but didn’t have the energy to get him out of the car into the pram etc etc. It’s also so handy now on the car journey up to my mum’s (a 2 hour drive) where we can just nip through the drive-thru for lunch for us and treat W to some of their fries (and a new toy!) Wouldn’t it be awesome if more shops/ food places had a drive-through option?! Imagine being able to buy milk, nappies from the comfort of your car! 3-Wide parent and child car parking spaces– there’s a retail park near me (Leckwith) that has parent and child spaces nearest to the stores, great you think… Then you realise they’re the same width as the normal spaces – what the hell is the point of that?! Give me a row of spaces in the far corner of the car park…. But make them wide enough to negotiate getting your baby/toddler out of the car…. And in my case, the pushchair which doesn’t fit in the boot. I can think of a few places that don’t have wide places, and it does put me off going there esp if I’m on my own and it’s a busy day. I once had to leave W in his pushchair while I got my car out of a space at St Fagans museum.. Not ideal! 4-Put gates on your Parks – parks are great for toddlers, but why do so many have wide open gates e.g. Victoria park in Cardiff?! There’s a brilliant little play area down in Cardiff bay which has gates that W can’t open…. Perfect… He can run around like a loon and I don’t need to worry ever second that he’s about to bolt towards a road etc! 5-Be proper family-friendly in restaurants – we hardly ever eat out with W… He won’t sit in a high chair for long so we end up having to entertain him/run after him while we take in turns to eat or watch our food go cold! We would probably eat out a bit more if eateries prioritised families with toddlers… Basically we want to be in and out as quickly as possible, served quickly, food brought out quickly…oh and you might as well bring the bill out with the food! Add gates to your park, we’ll spend money at your ice cream kiosk. Serve us before other people in a restaurant and you’ll have your table back quickly ready for your next paying customers! 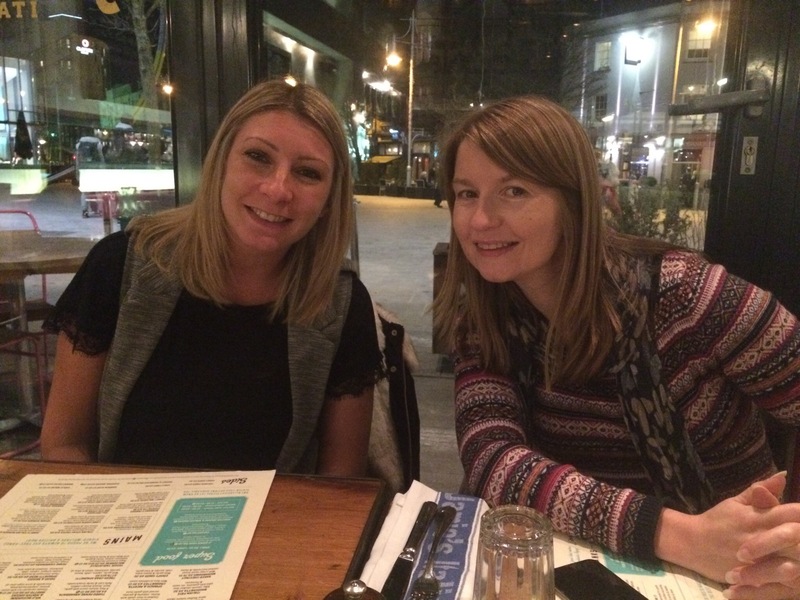 On a cold Monday night in February it was a delight to go to Jamie’s Italian in Cardiff City centre to catch up with friends and celebrate a birthday…. In terms of location, it couldn’t be much handier, bang smack in the centre of Cardiff and attached to the St David’s 2 shopping/food complex. So what did we eat? 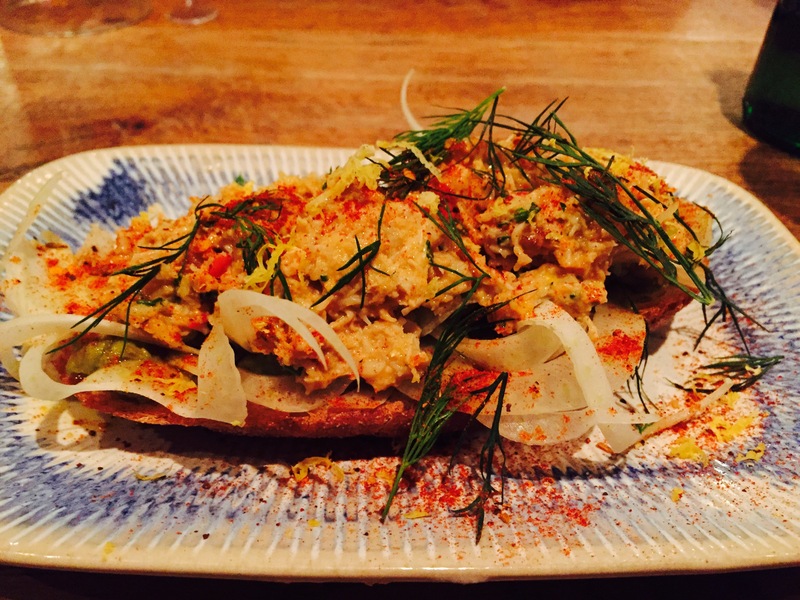 The three of us of all chose the same starter… Crab and avocado bruschetta (£6.70) which looked amazing and tasted even better! 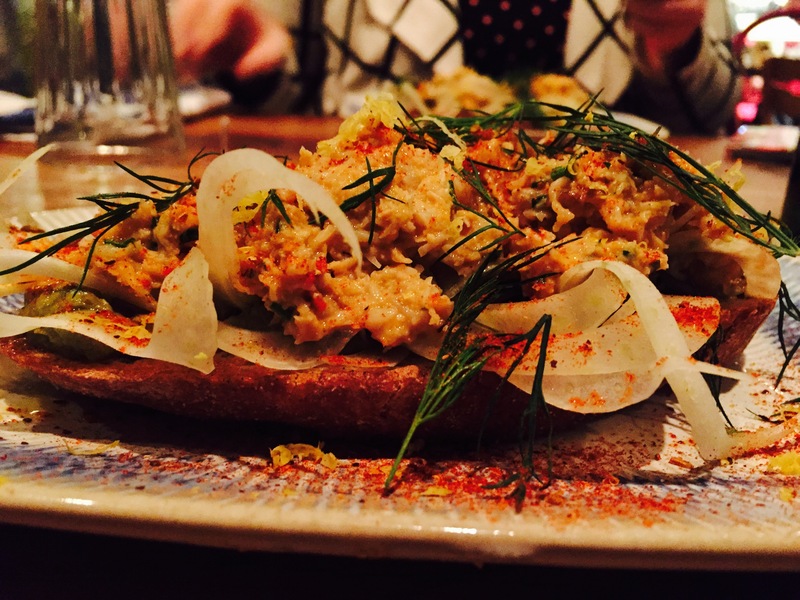 We agreed it was like a flavour explosion with yoghurt, chilli and fennel all complimenting the crab and avocado…. Really delicious and a perfect starter! Then it was time for the main course, I chose the ‘famous prawn linguine’ (£13.50) and again this was delicious, great egg pasta (made daily on the premises) and lovely flavours of prawn, garlic, chilli, tomato, saffron, fennel and lemony rocket… None of which overpowered each other, it was actually very soothing (comfort food!) Yum! 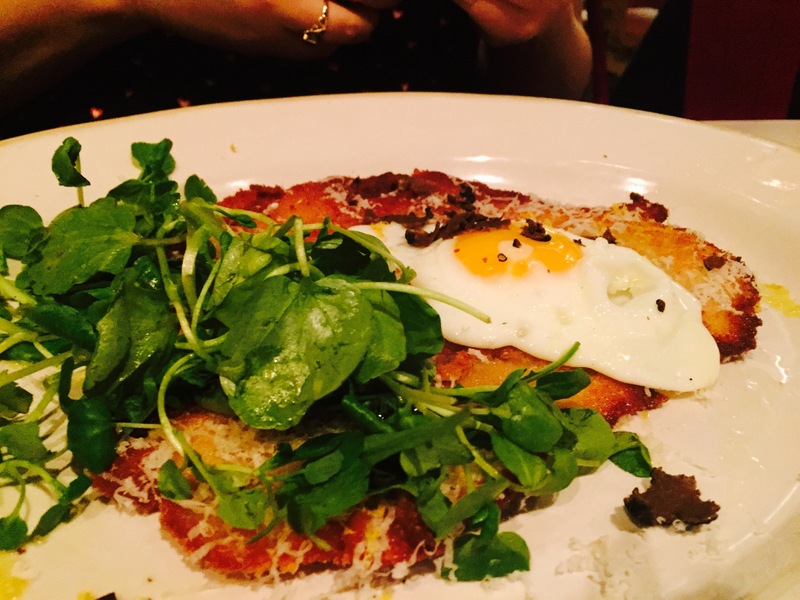 My friends had the classic tagliatelle bolognese (£10.95) and something I’d not heard of before but an Italian favourite ‘Turkey milanese’ (£13.50) which is basically breadcrumbed Turkey with an egg on top! All the mains were enjoyed and devoured… I should have got a photo of the empty plates! Only negative we could really think of is that the Turkey would have been even better with some potatoes on the side, same reason I plumped for the pasta instead of a Seabass special they had on the board… Can’t eat meat/fish without carbs ;)! They do have fries and garlic bread on the sides menu but I’m surprised they don’t do some kind of crushed potatoes or something? Now for the dessert course. At this stage one friend ducked out and had a hot chocolate – she told me tell it you was lovely! But the two pregnant ladies carried on 😉 I had the Amalfi lemon meringue cheesecake (£5.45) and it was so good! It was a decent portion but felt nice and light (guessing that’s due to the mascarpone) and it was so good I even ate most of the blackcurrants which I don’t normally like! I also had a lovely mint tea to wash it down with. 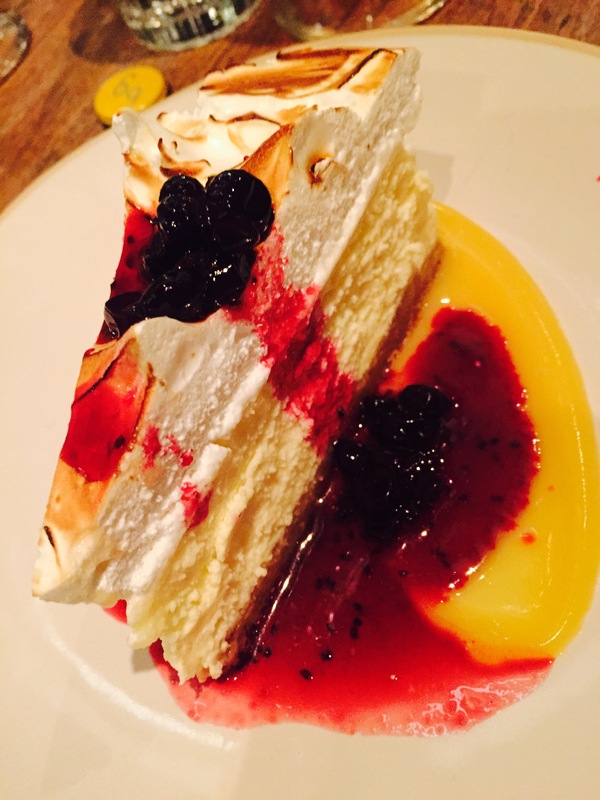 My friend ordered the apple and blackberry pavlova (£5.45) and loved it, I wish I’d tried it as I’d been close to ordering it myself… I’ll have to have it next time… Looks amazing too! So great location and interior, great food and now I have to mention our waiter Nedim. He’s been working there for 5 years which I thought was a good sign and reflects his passion for the food and brand. He told me how he’d lived in Italy for 6 years before moving to Wales and so that explains why he had a good knowledge on Italian food (I never knew fennel was good for digestion!). He was friendly, efficient and knowledgable, thanks for a lovely evening Nedim! 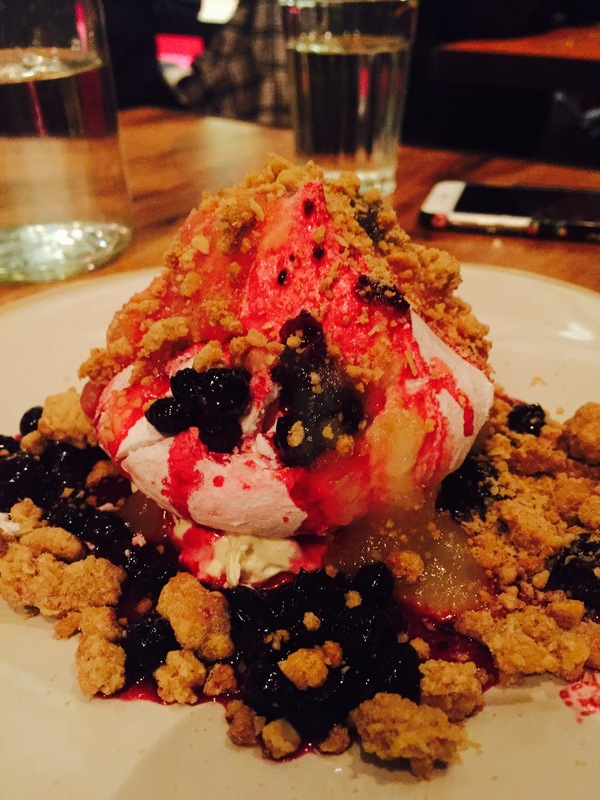 Thank you Jamie’s for a lovely night… Smiles all round and hopefully see you again soon! 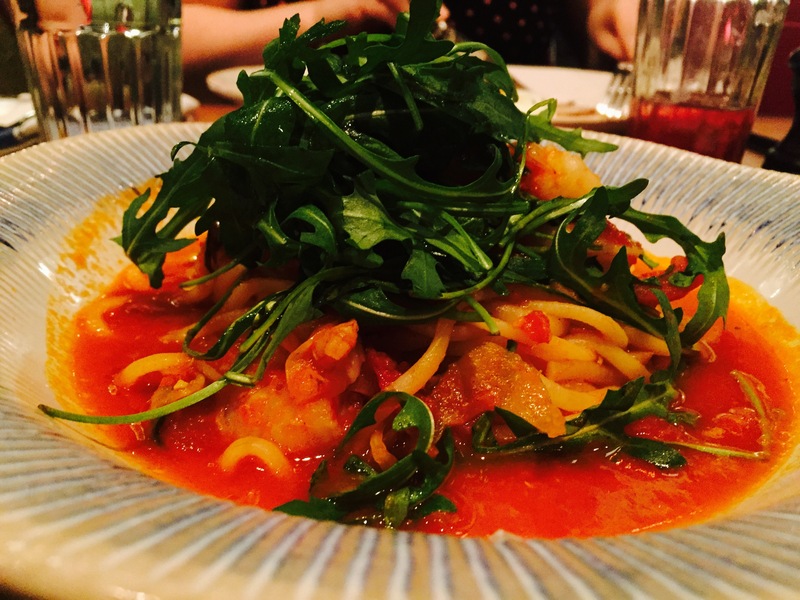 Small print: I was invited to review Jamie’s Italian in Cardiff, and was given vouchers towards the cost of the meal but we paid for the rest ourselves, and opinions are my own! When I was pregnant last time around, to prepare for giving birth we went to the NHS antenatal classes, I went to pregnancy yoga weekly, I read lots of books, magazines and blogs. It was the only time I could watch ‘One born every minute’ (couldn’t stomach it before or after!) We decided against paying for the NCT antenatal classes as we didn’t feel like we needed them, and they seemed like an extravagance. Fast forward two years, and I can’t believe I’m contemplating this, but I’m thinking of doing NCT…. To buy some new friends!! See, most of the mums I’ve met since having W who had done NCT generally agreed that the classes were ok but the best thing about it was the new lifelong friends they’d met…. Often the dads as well as the mums. When I was on maternity leave last time around I was lucky to know about 5 people that were also off, who I did meet up with from time-to-time. I met some lovely people at the long list of classes I did, but never felt quite confident enough to suggest meeting up for a coffee/play date. Quite a few of these lovely people were already in NCT groups (they’d met at the classes) and they seemed like clans… impenetrable. Inseparable. So I was quite envious of them at times. They were in whatsapp groups and messaged each other daily and during the night feeds. I can’t complain, whenever I felt lonely or was having a bad day, there was always a friend I could text who would understand exactly what I was going through… And I remember Twitter chats with other night feeders fondly…. But did I miss out? These little sisterhoods where you’re all going though the same issues, at the same time. I have plenty of friends, some with children, some without. I have a couple of close friends who’ll be off on maternity leave when I am. I’ll make plenty of new friends when W and his little brother go to school…. Author yummybloggerPosted on February 16, 2016 February 16, 2016 Categories pregnancy3 Comments on To NCT or not to NCT? Pre-travel and first few days! 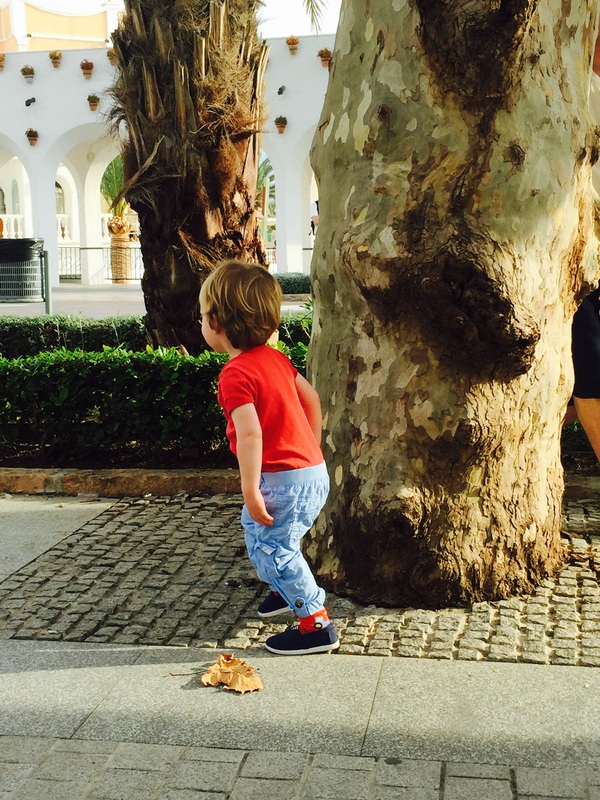 What we got up to – what to do in Nerja with a toddler! Nerja has about 4 or 5 beaches but our hotel also had its own private little beach, it was lovely watching W playing with the sand (pouring it over us! ), dragging us into the sea and picking up sticks! Our hotel (Balcon de Europa) was right on the front and in the centre of a pedestrian area which was great… We spent a lot of time just hanging outside the hotel with W chasing pigeons and scaring all the (friendly and well-fed) stray cats! And it meant we could mooch around the side streets, W kicking his new football around and inspecting all the drains! We did a lot of walking and mooching, lots of cute little shops and pretty houses to nose at! And the coastline of course. On Tuesday we walked up to the weekly market, was worth a trip but it was a LONG walk from our hotel especially as it was a hot day!! There was a park on the way, and a few dotted around town which was great for W. Oh we also took him to DinoPark soft play one day pre-dinner too… This was perfect for toddlers, and you pay when you leave based on how long you were there which I thought was a great idea! Having the in-laws around was handy, for a few hours here and there they looked after W, so one day we were able to have a lovely lunch date… And another day we chilled at the hotel (rooftop) pool. An added bonus of the trip was that an annual carnival was on while we were there… It meant some additional amusements for W (bouncy castles etc) and we stumbled upon the amazing carnival parade on our last night… Gutted I’d left my camera in the room as there were some amazing costumes and it was so cute to see whole families dressed up together, such an amazing sight! 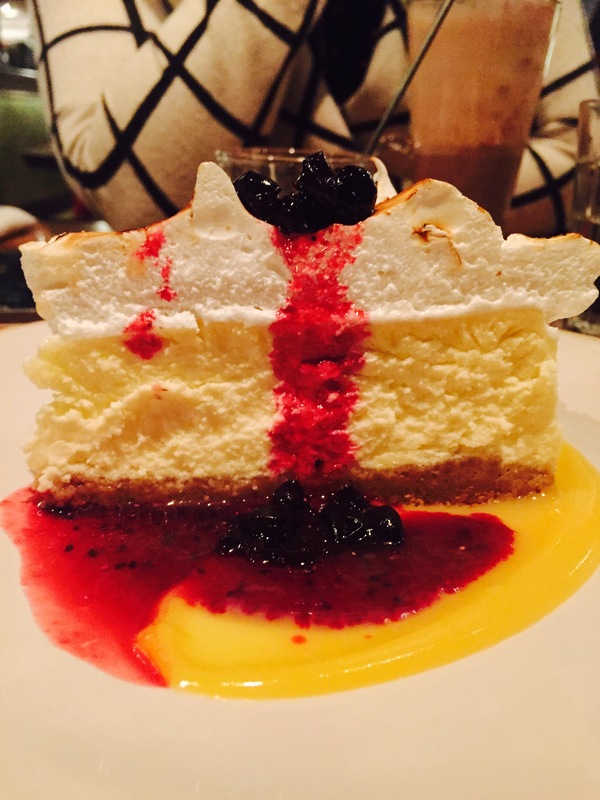 Italian food – my in-laws stumbled across a fab Italian that was so good we went there twice! 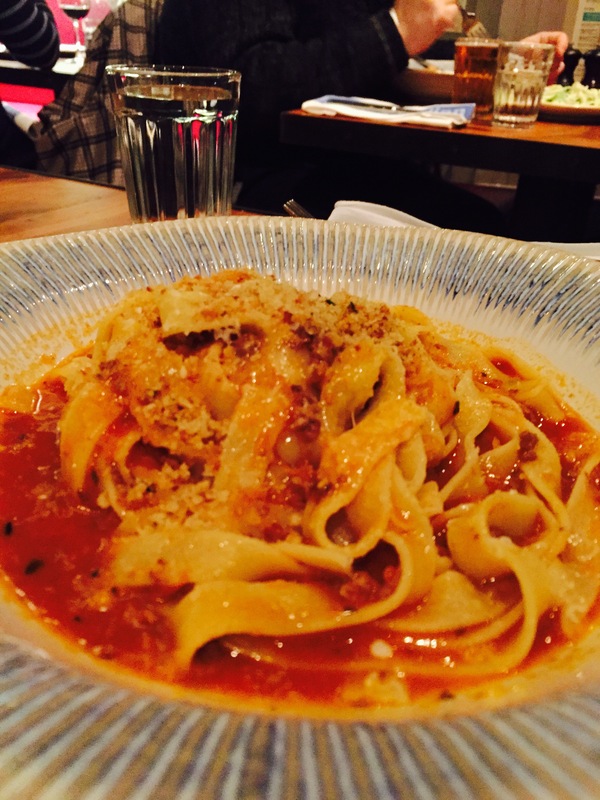 It’s called Gusto Italiano, it’s just round the corner from much busier restaurants but much cosier, family-run etc. and the pasta was all amazing! Drinks at Marbellas – we had food here once which was good but we preferred just having drinks here – for me, it was more about the location and ambience – a beautiful, huge terrace overlooking the coast which would b perfect for a wedding!! It’s always nice getting some mild winter sun, and great to see places in low season (so much cheaper too!). Nerja is a beautiful little town just an hour north of Malaga with none of the high-rise, English breakfast-signs-everywhere places like Benidorm. We had a lovely week just mooching about the town and beach, but there’s also plenty to do if you want to stay busy… There are some famous caves to visit, and Granada is just an hour away. Nerja was very toddler-friendly and the locals (and tourists) all fussed over W… He had a whale of a time!